This is a guideline for a rapid evaluation of agro-climate information systems. The questionnaire serves to evaluate project impacts and specific aspects of the climate service in need of improvements before scaling and is designed to provide both quantitative and qualitative response data. The guideline describes the process for data collection and data analysis and provides some preliminary results from a minor pilot survey in My Loi Climate-Smart Village in northcentral Vietnam. Two types of questionnaires are presented. The longer questionnaire is designed to take one hour at most and involves individual and focus group discussion with participatory rating and ranking exercises, while the shorter one takes approximately 15-20 minutes and is considered only for individual responses. Both can easily be adapted for illiterate respondents. Simelton E, Gammelgaard J, Le TT. 2018. 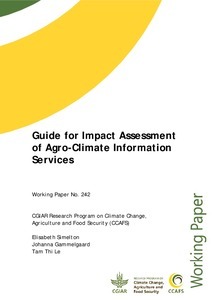 Guide for impact assessment of agro-climate information services. CCAFS Working Paper no. 242. Wageningen, the Netherlands: CGIAR Research Program on Climate Change, Agriculture and Food Security (CCAFS).